Kaboom! 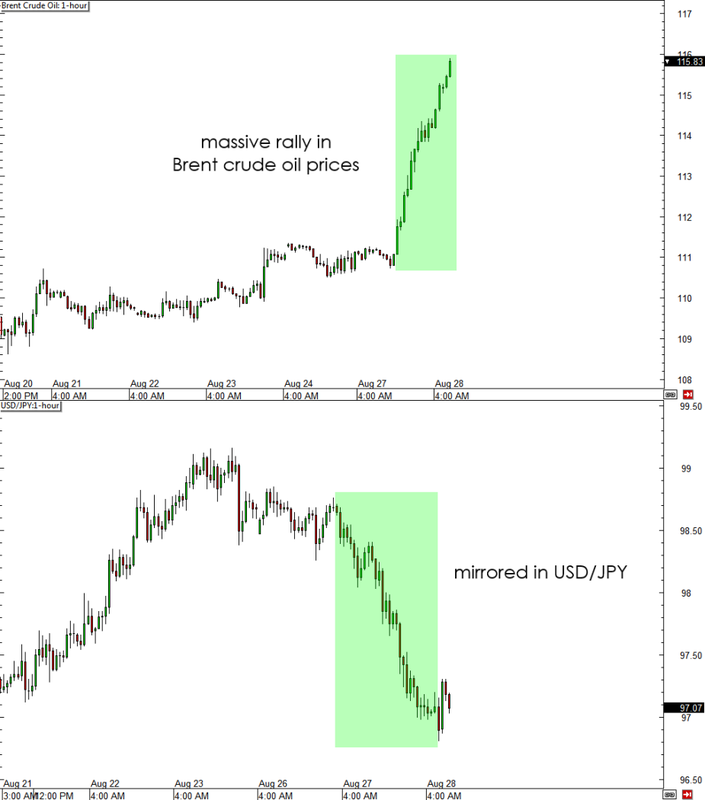 Did y’all see what happened to Brent crude oil prices and USD/JPY yesterday? In today’s edition of Piponomics, I explain how the situation in Syria has been affecting the financial markets. First up, lemme give you the 411 on what’s been happening in the markets lately. Risk aversion has crept back into the markets, as analysts and traders are concerned about what’s happening in Syria. The U.S., the U.K., and France are convinced that the government, led by President Bashar al-Assad, used chemical weapons on Syrian civilians in a conflict in the Ghouta area just outside Damascus last August 21, 2013. Word on the street is that this led to the death of more than 1,300 people. In response to this “attack,” American, British, and French officials have begun talks working towards a coordinated effort to take “limited action” against the Syrian government. What this means is still uncertain. Keep in mind that Iran is both a neighbor and ally to Syria. If we see military action take place against Syria, Iran may decide to back the Syrian government. Considering that Iran and Syria account for nearly 20% of OPEC oil production, this could cripple the world’s oil supply. This has spooked the markets, causing risk aversion to take over. The effect on the financial markets of the conflict in Syria was obvious. Brent Crude Oil, for instance, skyrocketed to $115.64, a solid 4.4% higher from two days ago. Moreover, WTI Crude jumped to $110.25 after already rising 2.9% the day before. It was the largest gain posted since May 2. And finally, other oil-based commodities like gasoline futures and natural gas also gained. The issue in Syria was also felt in the forex market. It can be seen clearly in the yen’s price action. Looking forward, if the situation in Syria escalates, we could see both oil and the yen continue to gain as risk aversion takes over. Given the concerns about the U.S. debt ceiling and the effect of the Fed’s monetary policy tapering on the economy, all these factors could lead to a downward spiral of doubt and fear in the markets. Do you think the conflict in Syria is priced in already?